Hi! Firstly, thank you for visiting my fundraising page for the UCDVO Nicaragua Development Project 2017! I hope at the very least you enjoy reading this with a heightened awareness of the work UCD Volunteers Overseas conducts every year. 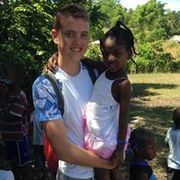 About myself; I am a 4th year Biochemistry student in UCD, Wexford born and bred with a keen interest in adam sandler and plain pasta, and this is 2nd time volunteering with UCD Volunteers Overseas (UCDVO). UCDVO is a college-affiliated charity (CHY. 15856) which since 2003 has sent over 1000 volunteers abroad on yearly summer projects to some of the worlds least developed countries. 2 years ago, I travelled to Haiti with UCDVO, and I loved the feeling gotten from making a difference in a country thouands of miles from home with the collective help of family and friends. This year, I will be volunteering on the Nicaraguan project. The Nicaraguan Developmental Project is one of the charities longest running projects, dealing with housing, health, sanitation and educational issues in the rural town of Somoto. Past projects have aided the building of the local health centre, housing, and ran educational programs for local children, work which we are proud of and which we are eager to continue! The aim for each volunteer is to raise €2600, through events, personal funding and donations, so any help you can give to this important work is very welcome! Thank you very much for your time, and stay posted for updates on our progress!